We teach YOU how to communicate effectively with your dog. Your dog is constantly watching you for cues. What are you really saying? From the minute your dog met you, he/she has been reading your energy, listening to your tone of voice, and observing your every move. If you are unaware of the messages you are sending to your dog(s), you're likely to get mixed messages back, i.e. UNWANTED BEHAVIORS! Our goal is to teach YOU how to communicate EFFECTIVELY with your pooch - in other words, in "dog language" - all the while fulfilling their true needs. WHAT IS AN "OWNER TRAINING" SESSION? Jana and/or Jay will come to your home for a 1.5 - 2 hour session (everyone who lives there or interacts regularly w/your dog should be present). 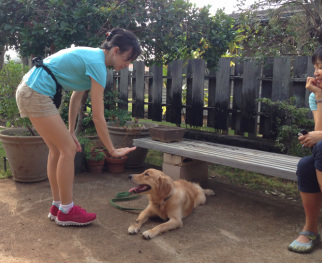 We teach you, hands-on, how to communicate effectively and be your dog's leader. Some people call us "Dog Trainers" (or often, "The Dog Whisperers of Manoa") but really we just understand what dogs need in order to lead balanced lives. We've studied Jan Fennel, Cesar Millan, and other dog behaviorists for advice, but most of our learning has been from working daily with hundreds of local furry clients over the last decade. Problems with FEAR/AGGRESSION/ANXIETY/BARKING/JUMPING/PULLING... OR ALL OF THE ABOVE? They almost always stem from a misunderstanding between owner and dog. We observe you, find the miscommunication, and teach you how to get the correct message across. If you are committed to exercising your dog daily, being a pack leader, and want your dog to lead a full, satisfied life, fill out the application below and we will contact you right away. A session with Jana and/or Jay is $200-$300, depending on your location and needs.